A tense Street Fighter V bout at the SXSW Fighters Underground invitational in Austin, Texas last Thursday showcased one of the game’s most compelling mechanics. American competitor Ryan “Filipino Champ” Ramirez and Fu-pin “RB” Kao from Taiwan fought tooth and nail for a much-needed group stage victory in the final game of their first-to-three set in which “white health” played a pivotal role. Unlike previous games, chip damage (or the minuscule amount of damage dealt by special attacks and supers on block) plays a much smaller role in Street Fighter V matches because it can no longer kill. More important are a handful of attacks that deplete a type of provisional health known as white or gray health. This damage slowly regenerates after a short period of time, but you can prevent this by forcing your opponent to block subsequent blows. Once you’re able to get a clean hit, the entirety of that white health is removed along with the attack’s normal damage. In this way, relatively weak attacks can become haymakers. One round away from walking away with the win, Ramirez whittled down Kao’s health with Dhalsim’s frustratingly long limbs. 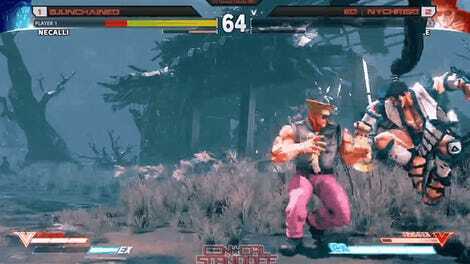 This smothering pressure forced Kao’s Urien to remain in Dhalsim’s Yoga Burner, a unique V-Trigger attack that coats the ground with flames and deals recoverable damage. After a great response left him with just a sliver of life, Ramirez was given the opportunity to unleash one more Yoga Burner and lock Kao down to ensure he couldn’t regain this “white health.” From there, it took just one light punch to deplete a huge chunk of Kao’s lifebar and two more to punish a dash for Ramirez to pick up the victory. What makes this win so interesting is the way in which Ramirez managed not only his own health, but Kao’s as well. By using Dhalsim’s Yoga Burner (which, instead of dealing “real” damage, applies white health), Ramirez was able to build up a good deal of potential damage in Kao’s lifebar and then steal it all away by teleporting in and landing a solid punch. This was made possible by his efforts to keep Kao blocking Dhalsim’s long-range attacks, and therefore unable to recover any of that provisional damage. Street Fighter V isn’t the only fighting game to employ this type of mechanic. The “red health” of the Marvel vs. Capcom franchise allows players to regain a portion of their character’s life by subbing them out for another, and Street Fighter IV characters would suffer a “yellow health” effect when absorbing incoming offense with armored moves. Street Fighter IV also featured an attack similar to Dhalsim’s Yoga Burner in Gen’s Shitenkensu ultra combo. 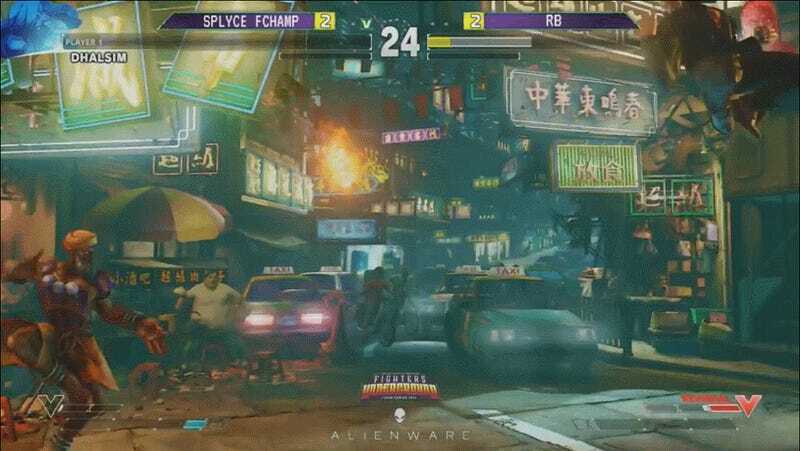 As this white-knuckle match from SXSW shows, competitive fighting games aren’t simply about maintaining your own health while also draining your opponent’s to zero. With smart play, it’s possible to make huge comebacks that rely on methodical strategy instead of all-out assaults. Ramirez is a champion of such tactics, and his continued evolution of Dhalsim strategy shows just how scary the mild-mannered yogi can be. SXSW Fighters Underground continues through today. You can watch the finals in the stream below.